Nomsa, her sixteen month old son Nathi and I met early one morning at the entrance to the open cast mine in Mafuyana, Southern Matabeleland, Zimbabwe. Nathi safely secured on her back, a shovel in one hand and a plastic bag with bread and water in the other, Nomsa hurried me along: “We must walk quickly, the earlier I start working, the earlier I can knock-off. This little one gets irritated when hungry, plus he has a bit of flu in this cold”. We walked briskly through the maze of thorny acacia and mopane bush for about thirty minutes—some three kilometres. Despite the absence of trails, Nomsa navigated the landscape well. We passed several abandoned deep vertical shaft gold mines before we arrived at the open cast mine pits where she worked with two other women, extracting ore. She sat Nathi down in the shade and began work, digging the rocky ore from one side, piling it on the other. Intermittently, she breastfed Nathi, usually when he became irritable. The women worked hard, pausing only for tea until mid-afternoon, when they packed up and we returned to Maphisa, the new development zone where they lived. Nomsa lived in a single room shared with her husband and two children. The room was dim; there were no curtains or lights. The small room was crammed with a double bed, a chipped wooden wardrobe, and a kitchen unit. The floor was cemented concrete, uneven, unrefined and dusty. Nomsa’s room was part of a larger housing unit that comprising a toilet and kitchen (without either water or electricity) and a bedroom on either side. Her neighbour, Mhlophe, lived in the second room. The two families cooked outdoors. The home, although small in size, presented a rich space for exploring infants’ topographies in Mafuyana. The physical and emotional characteristics the home contained contributed largely to the formations of childhood. This vignette introduces my investigation of the intersections of ‘urban’ development and early childhood. It forms part of the research of the First Thousand Days research programme at the University of Cape Town. Over eight weeks of summer 2016 I worked with infants and caregivers in Mafuyana, a new ‘urban’ township on the northern periphery of a growth point, Maphisa, in Southern Zimbabwe. Mafuyana forms part of Zimbabwe’s nationwide Operation Garikai project (Operation Live Well), which followed the Operation Murambatsvina campaign (Operation Clean-Up/Restore Order). Mafuyana was built for those dispossessed during Operation Murambatsvina and for others who had never owned a house. There were many young children and babies in Mafuyana. This community, mostly comprised of young adults, valued having children in their lives. Children were considered a life investment and caregivers hoped to be cared for by their children in their old age. However, infant care posed numerous challenges in Mafuyana where, as we have seen in the opening vignette, limited economic opportunities and poor ‘urban’ infrastructure posed daily challenges to infant care and well-being. My work is concerned with the ecologies that surround infant health and child loss in a developing context. In Zimbabwe, the high infant mortality rate is attributed to AIDS, dysentery, malaria, diarrhea, skin conditions and nutritional deficiency. The Zimbabwe National Child Survival Strategy Report (2010–2015) states that these deaths are mostly preventable. Risk factors include unsafe and unhygienic delivery environments, delays in seeking skilled medical care, home deliveries, poor antenatal surveillance and poor postnatal care. In Mafuyana, poor housing and a chronic shortage of employment opportunities contribute to these risk factors. Fieldwork interviews and home visits demonstrated the extent to which the new housing settlement was hazardous to raising infants. Frail housing was prone to invasion by burglars, pests and bad weather. In the absence of clean running water, residents used contaminated water sourced from Antelope Dam. Familial relations within and between homes also influenced the wellbeing of infants. It is easy to describe these material topographies but I was interested to explore more; to find ways to access how people understand infant bodies and well-being in Mafuyana. Standard biomedical descriptors such as ‘fontanelle’ or ‘heart’ were inadequate to the task; I soon discovered they did not get me to the heart of knowledge I sought. I therefore developed a methodology I term ‘baby body mapping’. This is a visual mapping technique that gains more access to people’s perceptions of their babies’ bodies in relation to the houses sheltering them and the geographies formed around them. 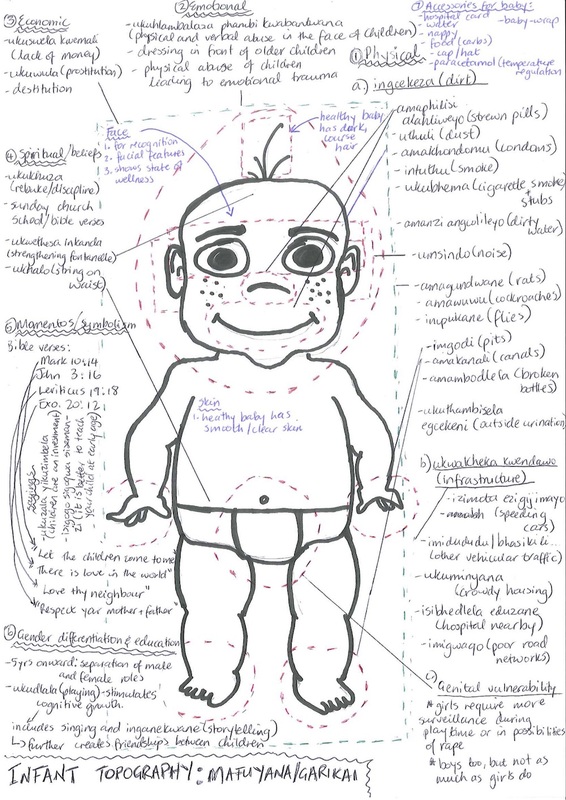 Body mapping has emerged as a useful method serving to connect the understandings of biological and social processes of the infant’s body. Andrea Cornwall (1992 and 2002) has used body mapping to examine women’s knowledge about reproduction and their interpretations of non-indigenous contraception in Mazvihwa, a rural area in Zimbabwe. This technique offered a bridging space between the biomedical and local understandings of the female reproductive anatomy. Hayley MacGregor (2008) analyses the use of body mapping in Khayelitsha, South Africa, as an educational tool that promotes the understanding of social and political aspects of HIV and AIDS. Baby ‘topography’ is a term derived from Geetha Ramani and colleagues’ (2010) investigation of babies’ self-awareness of their body shape and spatial configuration. Ramani states that neonates begin learning about their own bodies as newborns and can determine whether the hand caressing their cheek is their own or someone else’s. Furthermore, self-awareness of one’s topography increases with age and is associated with traditional measures of reflective self-awareness. Caregivers’ descriptions gave insight to the complex geographies—physical, economic, emotional, social and spiritual—that shape infant lives. Baby body mapping facilitated a less directive interviewing style which produced people’s own classifications and visual descriptions that were used as a basis for discussion. I implemented the baby body mapping exercise at the end of my research, during a focus group discussion I held with care givers who had been part of the project. By then I had a clear idea of the challenges infants and caregivers faced, such as those described in the opening vignette. Together, we drew a large sketch of a baby. When the mapping exercise began, caregivers were reluctant to share their ideas, but I reminded them that as a childless woman, I had much to learn from them. Each individual described parts of the body and meanings associated with them. Eventually, we produced a topographical map. This was the first time the participants had visualised their babies through a drawing. I was surprised by some of my informants’ perceptions, and had to overcome my own assumptions on what contributes to the making of a baby’s body. Given the context of precarious labour, and unemployment in the mining township, it is hard not to focus on infancy as a period configured by economic and physical constraints. I came to realise that I had placed an overwhelming focus on the physical and economic aspects of infancy, overlooking the spiritual, symbolic and emotional experiences. The body mapping exercise led to stimulating discussions about the women’s different perspectives on infants’ bodies. They described for example, ukwetheswa inkanda (‘strengthening’ a baby’s fontanelle), a ceremony performed after the umbilical cord has fallen off. This serves to protect the baby from any evils he or she encounters when introduced to the world for the first time. Approaches to the ceremony differed. Some wafted herbal smoke over the child; others used parts of animals believed to embody great strength, such as the honey badger and the elephant. However, they lamented no longer being able to use these animal parts due to inaccessibility. Another practice was tying a cord that had been blessed by a church pastor around a baby’s waist. This had the dual function of providing protection and serving to gauge the infant’s growth. Twins were perceived more problematic in comparison to singletons. Memory, a mother of six month old twin girls, was advised by her neighbours to roll them in the ash pit behind her house in order to calm their bouts of excessive crying. This practice is known as ukubhuqa emlotheni (rolling in ashes). Nomsa described having bathed her baby in a basin of water and soil scooped from a common public area in the belief that exposing her baby to ‘public’ soil would acclimatise him to the world. In these ways, caregivers sought to treat and protect children while exposing them to the complexities of the world. The topography of infancy in Mafuyana was more complex than it seemed. Although national policy seeks to protect children from preventable disease and death, caregivers spoke also of the need to protect children from social and metaphysical dangers. Their commentary on such dangers and their efforts to protect children in a context underpinned by economic hardship and limited opportunity suggest that it is critical to investigate local understandings of well-being. Examining infancy topographically and geographically through the body mapping technique provides a useful alternative to conventional interviews, which sometimes overlook underlying perspectives. The method shifted my perspective considerably. For example, whereas I had thought that children should be protected from dirt, I learned that dust and ash could be a necessary part of exposing the child gradually to the dangers of the world and in so doing, offering protection. Unlike structured interviews, infant body maps facilitate discussion and reflection on the ways parts of the body are perceived and treated. Infant topography produced by drawing a baby body map opens a space for deeper discussions that formulate infant geographies and the practices (and limitations) of care that surround them. Min’enhle Ncube is a Master’s student in Anthropology at the University of Cape Town and part of the First Thousand Days of Life research group. Her research interests in medical and developmental anthropology lie in early childhood and its interaction with the developmental and political space in Matabeleland South, Zimbabwe. This article is based on her current Masters research underway, which examines the development of infants in a developing urban-rural township. Gasper, A. 1988. Rural Growth points and rural industries in Zimbabwe: Ideologies and Policies, Development and Change 19(3) 425–66. Mlalazi, A. and Conyers, D. 1989. Is There A Future For Regional Planning In Zimbabwe? Paper Presented At the 1989 Conference of the Department Of Physical Planning, Masvingo. ‘Growth point’ denotes settlements which are earmarked for economic and physical development in Zimbabwe. The follow-up exercise did little to alleviate the country’s self-inflicted humanitarian crisis. A large-scale Zimbabwean government campaign, which started in 2005, to forcibly clear ‘informal’ structures across the country. Relative to the Maphisa rural community, this was classified as urban, regardless of its deprivation of electricity, underground piping to supply water and robust housing. Ncube M. Infant Topography: Baby Body Mapping in Maphisa, Zimbabwe. Somatosphere. 2016. Available at: http://somatosphere.net/2016/infant-topography-baby-body-mapping-in-maphisa-zimbabwe.html/. Accessed April 25, 2019. Ncube, Min'enhle. 2016. Infant Topography: Baby Body Mapping in Maphisa, Zimbabwe. Somatosphere. http://somatosphere.net/2016/infant-topography-baby-body-mapping-in-maphisa-zimbabwe.html/ (accessed April 25, 2019). Very interesting. Keep it up dear daughter.